After two busy days we decided to take it easy today and stayed at home. On Saturday we went on the walk around Castle Combe as planned. 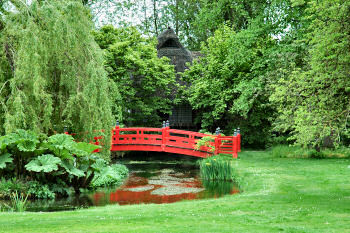 Yesterday was a gardens day: First the gardens at Wilton House near Salisbury, then Heale Garden in Middle Woodford. The weather turned out to be quite pleasant on Saturday after some initial doubts, so we drove to Castle Combe to go on the Castle Combe to Ford walk I had been on earlier in the year. We left late in the morning and arrived in Ford for a late lunch at the White Hart Inn. Despite a good variety of bar meals we all opted for the same dish (Caesar's salad with chicken and bacon), but it turned out to be a good choice, enjoyed in the courtyard next to the river. A pub to return to during another walk. 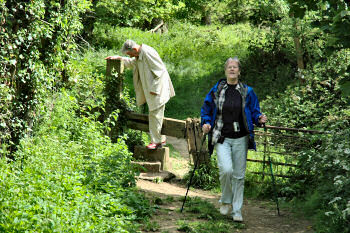 After lunch we continued with the walk back to Castle Combe, crossing a few more stiles on the way. Sunday turned out to be a gardens day: My mother had asked to visit Wilton House again, as she had quite liked it when we visited it eight or nine years ago. 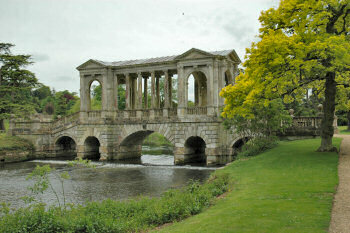 This time we didn't go into the house, but just visited the grounds including the impressive Palladian Bridge. We also used the opportunity to walk through the fairly new arboretum, which hadn't existed at our previous visit. Only lunch turned out to be difficult, the tea room didn't look very inviting, neither did the restaurant at the Wilton Shopping Village. The afternoon then was pure chance: We left Wilton on a slightly different route than we had arrived, a split second decision where I just thought let's go straight on instead of turning right. Passing a sign for a "Wheatsheaf Inn" and also Heale Garden, I decided to give it a go. It turned out to be a good decision: The Wheatsheaf Inn (sorry, couldn't find a good website) in Lower Woodford was a nice pub with a sunny garden and quite good food served all day. I remembered Heale Garden from an earlier visit and thought my parents might like it as well, which they did. Two gardens in a day, not too bad. The Bank Holiday Monday will now be spent at home, reading, drinking tea, relaxing. We might go for a short walk in the town gardens later in the afternoon. Dinner will probably be at Connie's.